As touched on in a post published on PlayStation.Blog on Friday, June 6, the grand free-to-play shooter Planetside 2 will be making its way onto Sony’s PlayStation 4, and it won’t require a PlayStation Plus membership in order to be played. Planetside 2’s creative director Matt Higby took time to talk about what plans are in place for the game regarding this year’s E3 next week, touching on events, what new features are on the horizon for the game, and that the game would not require a PlayStation Plus subscription. “Now the team is looking forward to an exciting summer full of events and reveals,” Higby wrote, “kicking off this month at E3 and MLG Anaheim [Friday, June 20 through to Sunday, June 22] with the very first hands-on playable version of PlanetSide 2 on PS4! 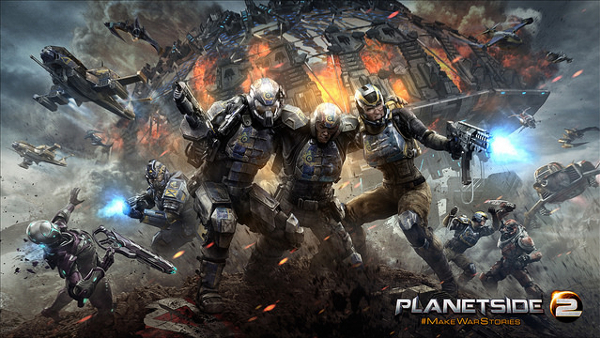 We absolutely can’t wait for you to experience the epic scale and intensity of PlanetSide 2. One of the best things about working on a game like PlanetSide 2 is that it’s a living, evolving game that’s constantly being updated and improved upon,” Higby continued. “In addition to work being done for PS4, the team is working on a lot of content and game systems enhancements to the live game. Some of the biggest features we’re excited to deliver in the next few months are: Hossin, our fourth full 64sqkm continent, an advanced achievement system called Directives, player-driven continent conquest/locking, and expansions to our game’s Outfits systems. Though Higby didn’t reveal a specific date as to when Planetside 2 will arrive on PlayStation 4, at least players won’t (hopefully) have to wait too much long for the game to become available--especially since a playable version will be showcased at E3. Be sure to check out our Shelby Reiches’ preview of Planetside 2 for PC.